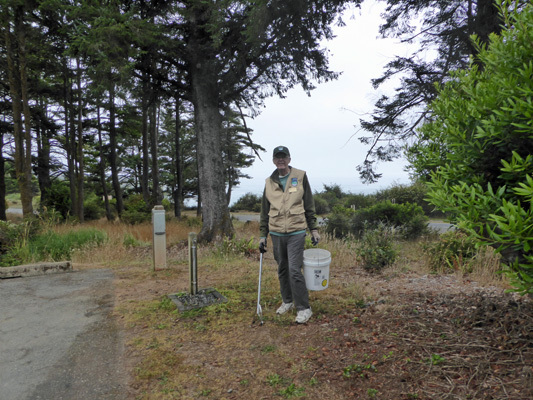 We were site cleaning camp hosts at Harris Beach State Park in Brookings, Oregon for the month of August 2016. 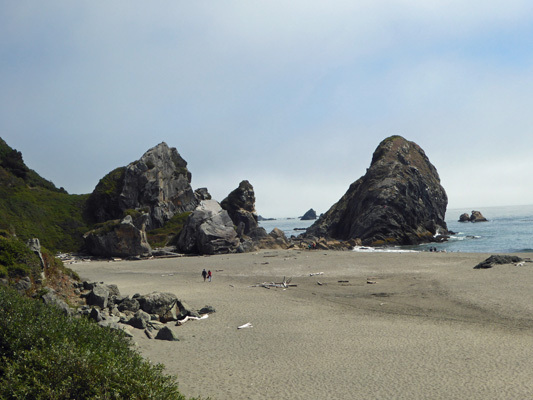 Harris Beach is on the beautiful Wild Rivers Coast of southern Oregon. It has a gorgeous Day Use area with beach access, rocks, tide pools and lots sandy beach to walk. 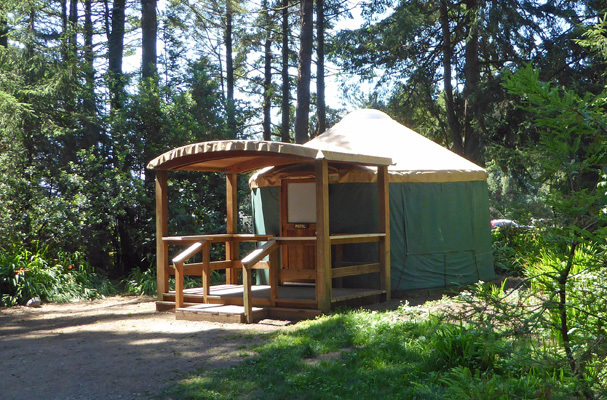 The campground has 35 full hook-up sites, 50 electrical sites, 60 tent sites, 6 yurts and a hiker biker campground with 12 sites. Folks can reserve sites up to 9 months in advance (and they do). In the summer time, it is full nearly every night with what few empty sites there are being due to folks who are no-shows for reservations. There are a few sites that have gorgeous water views (when it's not foggy) but most of the sites are nestled in among hedges and trees. This is a quiet family campground with a Junior Ranger Program each morning and an evening Ranger Talk each evening. Some folks come and stay for a full week while others stay only a night as the work their way up or down the Oregon Coast. The average length of stay is 3 nights. 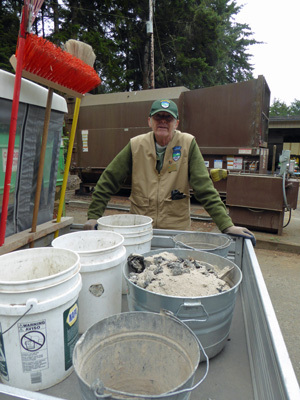 There are interpretive hosts (a couple) who help out with the Junior Ranger Program each day during the summer. 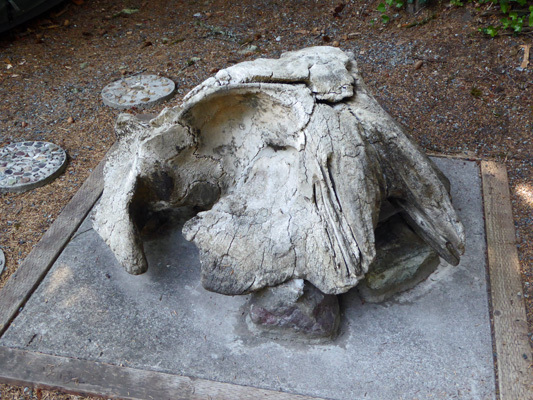 There is a special Junior Ranger Yurt where they have their programs that comes with its own whale skull. The hiker biker campground serves folks hiking the Oregon Coastal Trail and biking along the coast (both very popular endeavors though the bikers outnumber the hikers considerably). 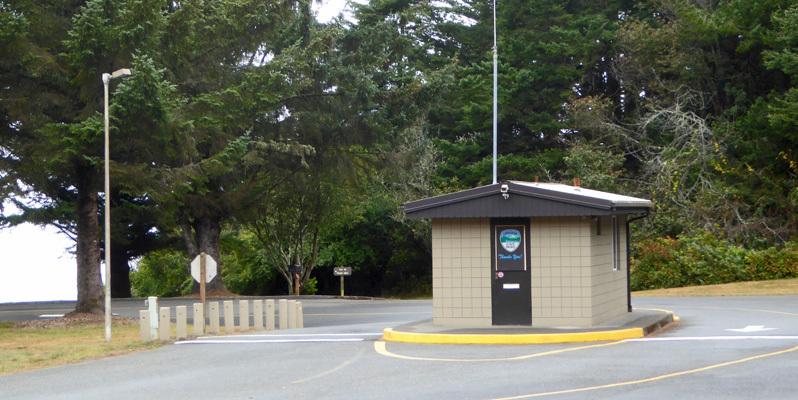 There are two sets of hosts who have their campsites next to the wood shed down near the main entry to the campground. One set cleans the yurts when they are vacated (rarely do all 6 of them vacate on a single day and occasionally there is a day when no one checks out at all) and are the relief two days a week for the hosts next door. The second set of hosts sell firewood each day from 3 to 8 pm and provide relief two days a week to the yurt cleaning hosts. They also check the bathrooms for toilet paper twice a day. We were one of two sets of site cleaning hosts who have their sites up in the upper portion of the B Loop. 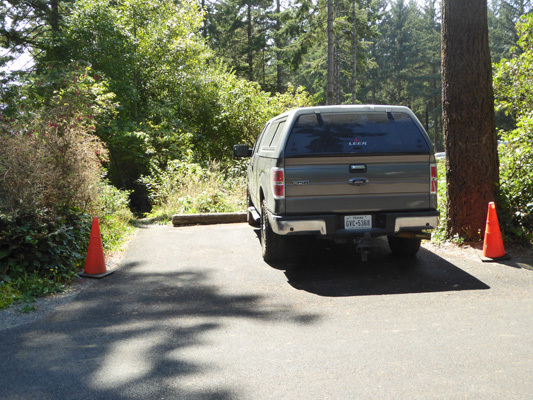 The site is just a little short for most folks so they give you a parking space across the road for your vehicle. We used the orange cones to block the spot when we took the truck out so that it would still be waiting for us when we came back. As usual with hosting at state parks, we received our full hook up site free of charge in exchange for working 5 days a week. We worked Friday through Tuesday and had Wednesday and Thursday off. The other set of site cleaing hosts (whose site was right next door to ours) worked Wednesday through Sunday. That meant that there were two sets of us to clean sites on Friday, Saturday and Sunday and we were on our own on Monday and Tuesday and our compatriots were on their own on Wednesday and Thursday. Each morning at about 8:45 we'd walk down the path next to our truck to the shop area to pick up our golf cart and a hand held radio. Then we'd go to the check in booth and pick up a clip board with the list of sites that needed to be cleaned for the day (all the sites being vacated that day). If there were two sets of hosts working, we'd have a choice of either the A and B loops or the C and D loops. If we were on our own we'd get the list for the whole park. On Fridays and Sundays there could be 80 or more sites to be cleaned (with two sets of hosts working) while on Mondays and Tuesdays we usually only had 50 to 60 sites for the two of us to clean. Harris Beach asks folks to turn in their hang tags when they leave so that they can monitor which sites are available for cleaning (and for new folks moving in). The early departing folks would already be highlighted on our list when we picked it up so we'd know which sites to start with. The campground has grown and expanded over the years so it's a little confusing to navigate to begin with. It took us about a week of roaring around in circles before we got the pattern down so that we knew how to get to all of the sites easily. The first day we worked, we were on our own with 56 sites to clean and we had a heck of a time figuring out how to get to some of the sites in the A loop. Each site comes with a fire pit, a picnic table and a paved parking area. Some of the tent sites have big grassy areas and others have very small tent pads. Walter patrolled the sites for litter and dog poop while I cleaned the fire pits. 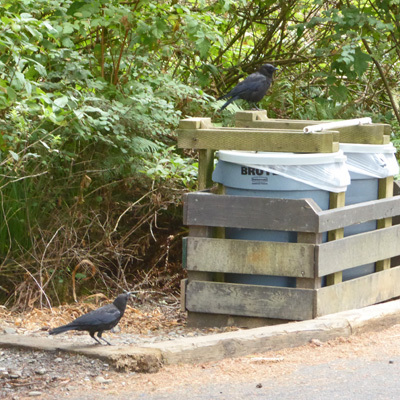 They provide dog poop bags at the wood shed and ask folks to clean up after their pets but Walter still ended up picking up two or three piles a day (at least they provided us with poop bags too). 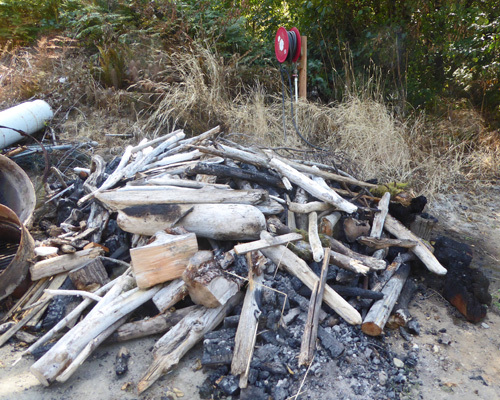 We were asked to remove any partially burned wood and place it on the grill or next to the pit and then pick out all the trash and smaller pieces of burnt wood. If the pit was full we'd rack it up and dig out the burnt wood and ashes with a shovel. 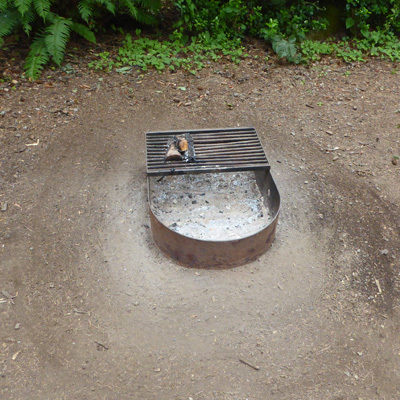 When we were done we'd then rake around the pit to clean things up. And big round ones with a large quantity of gravel in the bottom. Between 10 and 15% of the folks didn't put out their fires before they left (which is against the rules but hey what else is new?). This meant that we had to draw water (sometimes from a communal faucet two or three sites away) and douse the fires and then clean them out. This was my least favorite thing since it smells and is basically pretty messy. 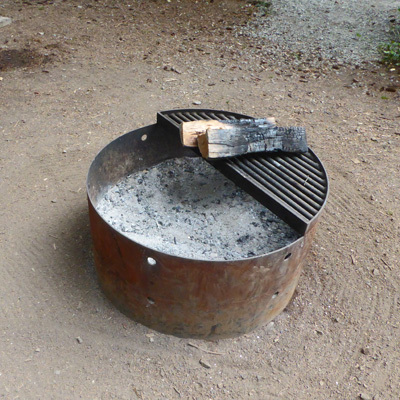 It's amazing how much ash can rise up with the steam when you douse an ash covered charcoal fire. More than once I was covered with ash from the waist down when I got done. Usually by half way through the morning we'd have to stop off at the shop to dump off our ash collection at the ash dump because we were full up. 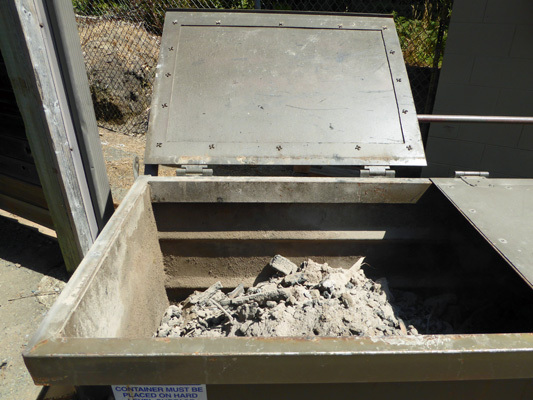 The ash dump was fire proof which was a good thing because every once in a while I'd shovel up some stuff that looked like it was out and wouldn't be. 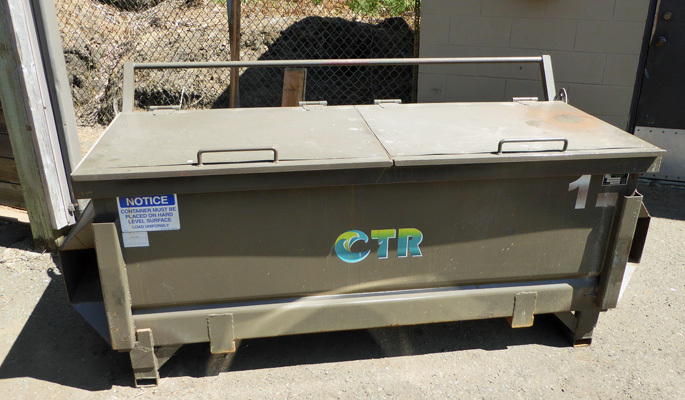 We'd fill this thing up in about 5 days and they'd call the refuse company and they'd come and take it away and bring it back all rinsed out and beautiful. If people left large pieces of drift wood in their sites we'd gather them up and take them to the branch dump down the hill from the entrance. We were asked to water down anything we put in this dump because last year a branch pile like this caught fire in a park in Central Oregon and ended up burning down several buildings. Most days we were done cleaning sites by 1:30 or so. Quiting time was more a function of what time the last folks vacated their sites than how many sites we had to clean. We usually had a point about 11 or 11:30 when we'd cleaned all the available sites and no one else was moving yet so we'd take a break. On Saturday or Sunday, sometimes we'd end up taking two breaks because people were being so slow. It took us between 4 and 5 minutes on average to clean a site. Yes, there were some that took no time at all and others that required a lot of time to get the fire out but on the whole we could easily get 12 or more sites done in an hour. So getting 60 sites done in 4 to 5 hours wasn't difficult. However there were days when we had 10 or 15 sites we were waiting on at the 1 pm check out time and they were spread all over the park so we weren't done for the day until 2:30 or so. We were asked to check in with the booth each time we'd cleaned 10 sites (so they know which are available for move-in) and to be sure to check in at least once an hour (there were times when we only did 5 or 6 sites in an hour mid morning waiting for folks to leave). Staff were really good about keeping on top of the situation in terms of folks who weren't ready at check out time so we didn't have to nag them, the ranger did that. However, they didn't start doing that until 1:15 so it could take them a while to work through the whole 150 site campground. We had very little interaction with campers. We'd wave at folks and say good morning as we drove around and usually once a day someone would stop us to ask a question (often times something that we sent them to the booth for the answer). Every now and then someone would stop us to tell us what a nice job we did in keeping the park clean--it's a very well kept park and we had no one complain to us about their sites not being clean. When we first started this gig, we both hurt by the end of the day. It was in the low 50's most mornings and riding around in the cold damp air was hard on us. After a few days we learned to wear our long johns and that helped a great deal. 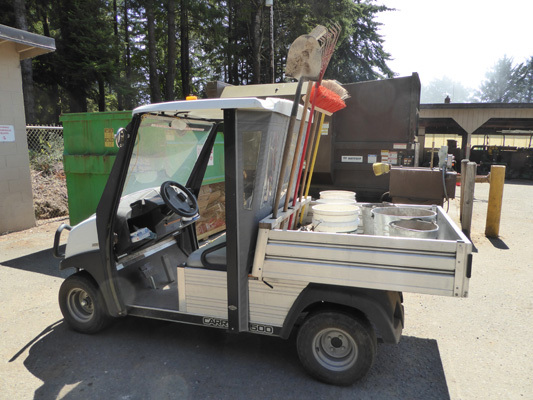 We also got used to the rhythm of the work--it's a lot like playing 18 holes of golf in that you get in and out of the cart a lot of times and do a bit of walking around and a few squats and lug stuff about and then put your tools back in the cart and go. The days that stretched beyond 5 hours were a bit much for us and we were tired but the days when we were done by 1 pm or so were okay. Walter has a real eye for lost change. In any given day, he could find pennies galore. 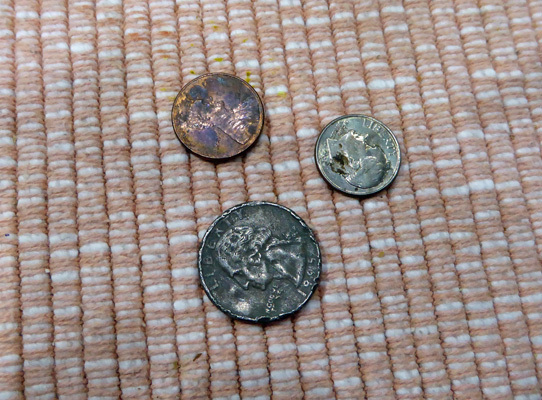 Here's a typcial day's haul. He's probably collected $3 or $4 dollars in change across 3 months of hosting this year alone. As he loves to say, "Stick with me, babe. I'll keep you in small change." People leave the most amazing things in their sites when they leave. Some of it is clearly trash. Some is perishable and not worth much and some is clearly valuable. We tossed the trash. And we took the valuable stuff to the shop where all the lost and found items are tagged and kept in case someone comes back for them. The in between items we usually found a home for either with us or with the other hosts. This park doesn't have a lot of native plants but it does have lots of other wonderful plants that have gone wild here. 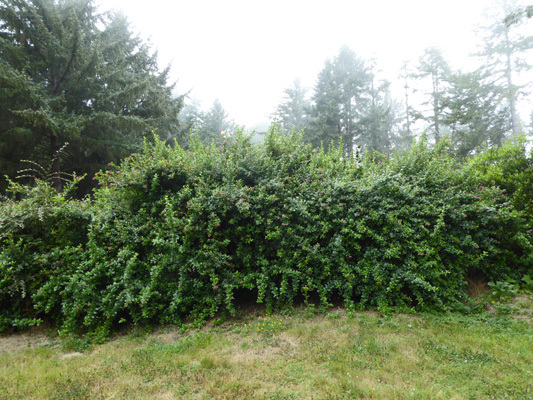 Many of the sites are separated by escalonia hedges. In August the escalonia hedges were in bloom. 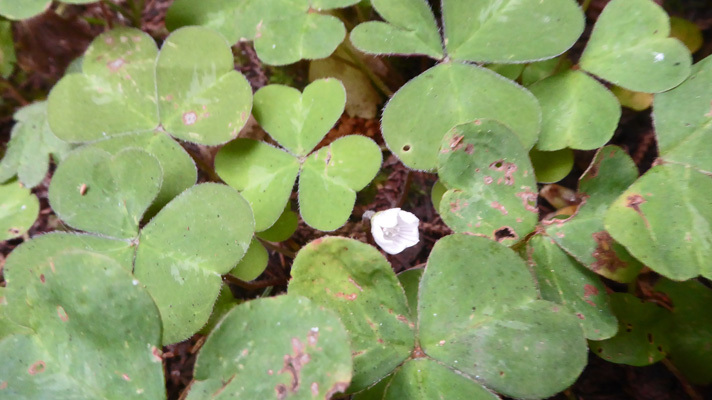 The shady spots down in among the trees have redwood sorrel (Oxalis oregana) some of which was still in bloom. 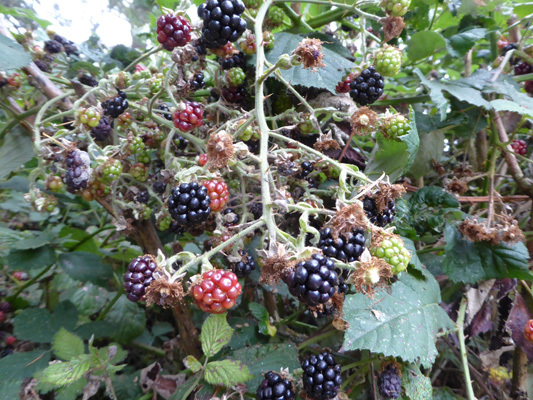 There are of course Himalayan blackberries (an invasive weed on the west coast) growing in the hedges. 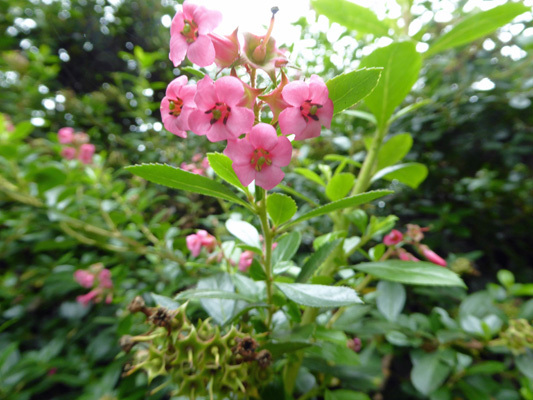 Lots of them grow in the shade and aren't very sweet but when you find some with good sun they're lovely. 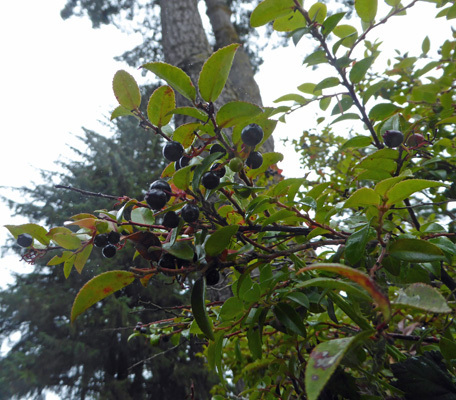 There are hedges of native Evegreen Huckleberries too and they were ripe in August. Again they were sweeter with more sun. 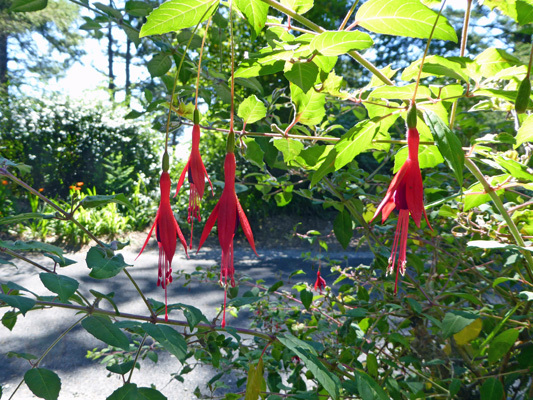 And there are tons of hardy fuschias that are mixed into the hedges too. 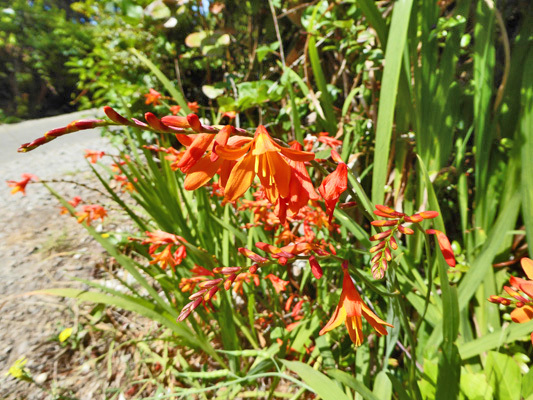 Crocosmia has escaped from gardens here along the coast and was in bloom everywhere including along the edges of campsites. 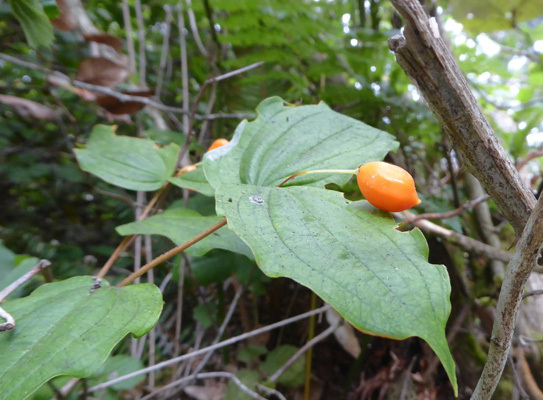 Here and there I found the berries of Smith's Fairybell (Disporum smithii) which is a native. 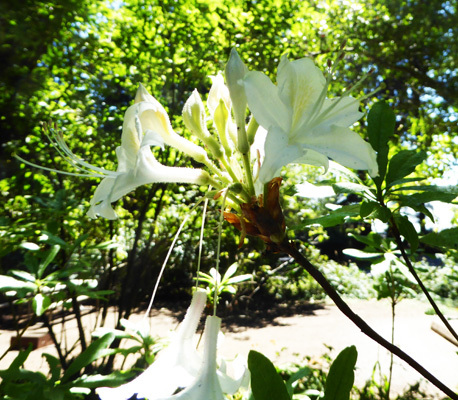 I also found several Western Azaleas (Rhododenron occidntale)--which are native--in bloom even in August. 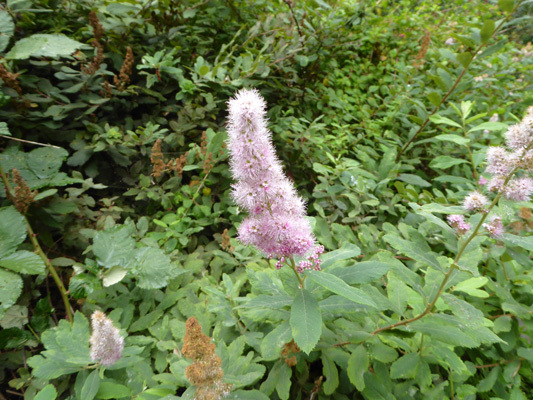 And there are several hedges of Hardhack (Spiraea douglasii) which are also native. 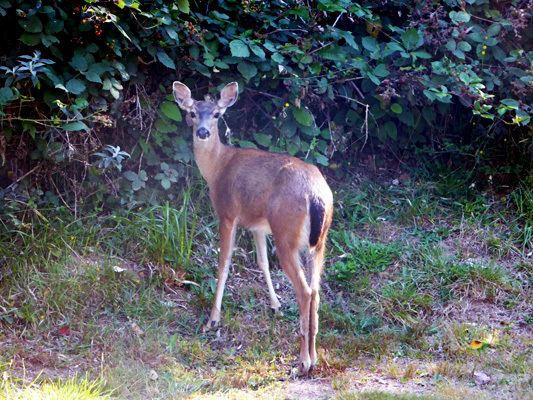 We were visited a number of times in our campsite by deer eating on the blackberries. 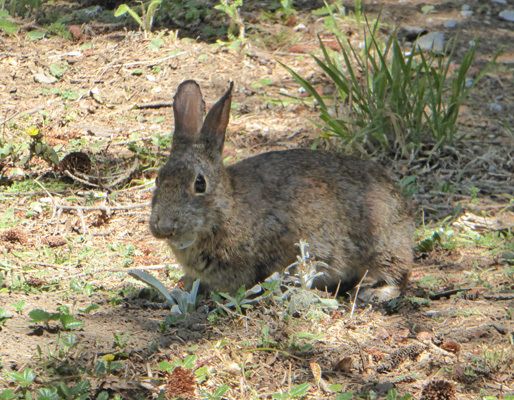 And there are lots and lots of rabbits all over the place. We had gorgeous weather the first week we were here with sun from the get go each day. Then we had 2 weeks where we had fog in the morning that would burn off by about 11 to 12. The final week it was foggy and/or cloudy every day and we had only a few minutes of sun now and then. Our first 3 sets of days off we had sun and then the 4th set we went inland to the redwoods in California and found plenty of sun. Highs most days were in the low 60's though the days the sun didn't make it out it was often only 58. Brookings provides 2 laundromats and a wonderful Fred Meyer for grocery shopping. There is also a big Ace Hardware. 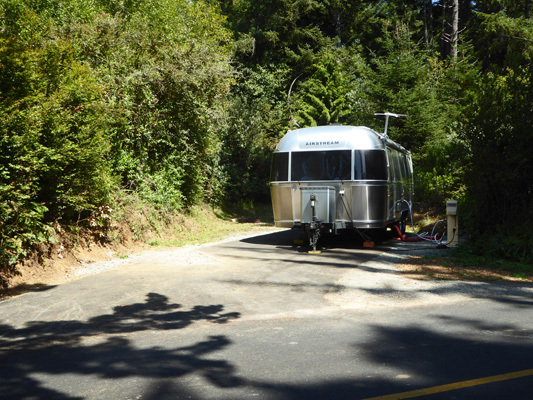 The campground is only about a mile out of town so it was very easy to do errands even on days that we worked. We got TV over the air (including a good PBS station). Our Verizon and Sprint phones worked and our Straight Talk (Verizon network) hot spot worked marvelously here. The Brookings library has free wifi that is really fast (and free) and we'd stop by there once a week to do heavy bandwidth tasks like updating antivirus programs. Hosts got together each Wednesday morning at 8:30 for breakfast at Matties Pancake House on the south end of town--this included the hosts at Crissey Field down near the California border and the hosts out at Loeb State Park which is about 10 miles east up the Chetco River. We enjoyed exploring Boardman State Park just north of Harris Beach and we also took a trip down to Jedediah Smith Redwood State Park in California to hike in the redwoods. This is a great place to host. The staff is friendly and helpful. The group of hosts we worked with were all nice and worked well together. All the host information was very well organized and they were prepared for us when we arrived and our training was good. Be forewarned though that the site cleaning host jobs are a lot of work. Be prepared to put in 5 plus hours of trash picking and ash digging each day in cold damp conditions even at the height of summer.